I have to say, as much criticism as I have for the ending of Lost, I was hoping the actors would get a little Emmy love. 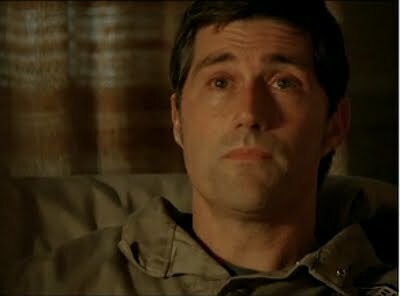 I expected Michael Emerson and Terry O'Quinn to cancel each other out for the best supporting actor Emmy, but I thought Matthew Fox really had a shot of grabbing a much-deserved award. Elizabeth Mitchell unfortunately didn't have a chance against the heavyweights in the guest actress category, though she certainly had just as much right to the Emmy. Ricky Gervais, how I love thee. You just never know what he's going to say, or how naughty it's going to be, and you're always waiting for that trademark giggle of his to escape. He's just full of so much glee--his exuberant joy at discovering that Winter Olympics Opening Ceremony director Bucky Gunts actually DID win the category after his riff on the guy's name was absolutely priceless. Jimmy Fallon's musical numbers on stage and with audience guests like Julianna Margulies, Tom Hanks, and Stephen Colbert were made of win. The Twitter comments Fallon read out--not so much. Julianna Margulies, Mariska Hargitay, Susan Sarandon, and Christina Hendricks win the Classy and Gorgeous awards. I'm thrilled that Jim Parsons won a much deserved Emmy award for his role as Sheldon on Big Bang Theory. I also loved that he said he was grateful just to be working, but even more grateful to get to play such an outstanding character. Modern Family gets tons of deserved buzz (yeahy for the Emmy!) but Big Bang Theory is consistently and inventively hilarious. The In Memoriam was heartbreaking--we lost a lot of wonderful people this year. I was shocked and saddened to see Caroline McWilliams from 80s series Benson; she lost her battle with cancer earlier this year. Jewel's tribute song was lovely, and for once it seemed to deter some of the clapping favoritism--though not all of it. Over all the Emmy Awards was fast-paced, mildly amusing, and some of the "little people" gave great speeches. As is typical of awards shows, many of the programs that won were series or specials that I haven't seen--which definitely dampens the whole enjoyment of the Emmy Awards. However, the awards do their job in enticing us to check out some of these award winning shows we've missed. I'm definitely curious about Temple Grandin now. What did you think of the Emmys? 5 Canceled Series To Nab Emmy Awards?